be on time. Late arrivals will be allowed to race in some non-competitive races with the leaders cars. ● Registration and car inspection for Tigers begins at 5:30 PM. 4. Awards: 1st, 2nd and 3rd place awards will be given by speed per rank. There will also be a “Best Design” award for each rank. The maximum overall width (including wheels and axles) shall not exceed 2¾ inches (6.9 cm). The minimum width between the wheels shall be 1¾ inches (4.4 cm) so the car will clear the center guide strip on the track. The minimum clearance between the bottom of the car and the track surface shall be 3/8 inches (0.9 cm) so the car will clear the center guide strip on the track. The maximum overall length shall not exceed 7 inches (17.8 cm) including wheels. The wheel base (distance between front and rear axles) may be changed; however, the overall length of the car (including wheel protrusion) may not exceed 7 inches. Weight shall not exceed 5 ounces (141.9 g). The reading of the official scale will be considered final. The car may be hollowed out and built up to the maximum weight by the addition of wood or metal only, provided the material is securely built into the body or firmly affixed to it. No liquids or loose materials of any kind are permitted in or on the car. Mercury, BB’s or any other material used to help propel the car cannot be used. Details such as steering wheel, driver, spoiler, decals, painting and interior details are permissible as long as these details do not make the car in violation of any clearance specifications and are securely attached. Cars with wet paint will not be accepted. Tape may only be used for detailing or decoration. Parts or weights may not be attached solely by tape. Hot Glue works well. Super Glue is too thin, and may bond something you did not want glued – such as wheels to axles. Severe undercutting (<45degrees), notching, and “V” shaped front ends, designed to give a car an advantage at the starting pin are strictly prohibited. Only official “Scout Grand Prix Derby Kit” wheels and axles can be used. Wheels may be lightly sanded to smooth out molding imperfections on the tread area. This light sanding is the only modification allowed. Thin sanding, or wafering the wheels is prohibited. Solid or grooved axles are strictly prohibited. Axles may not be altered in any way except for polishing. Wheel bearings, washers, bushings, and hub caps are prohibited. The car must be free-wheeling, with no starting device or other type of propulsion. Only graphite or powdered Teflon “white lube” will be allowed for lubricating the wheels. Lubrication will not be allowed after the car has been weighed in or during the race. Each scout may enter only one car in the competition. 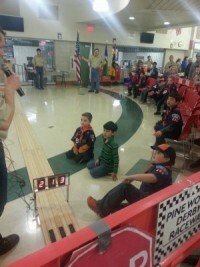 Use only the Official Cub Scout Grand Prix Pinewood Derby car kit that is provided by the Pack. The car must have been built during the current year (the school year in which the Derby is held). Cars that have competed in a previous year are not permitted. If a car jumps the track, or loses parts, the race will be run again. If the same car jumps the track a second time, and does not interfere with its neighboring car, the race will count. If the car interferers with its neighboring car, at the discretion of the Race Marshal, the car will be eliminated from that heat (and given a “did not finish” [DNF] time) and the race will be run again. If a car becomes damaged and can be repaired in a reasonable amount of time (a few minutes), the race will be run again. If not, the damaged car will be eliminated from that heat and given a DNF (Did Not Finish) time. All rulings by the Race Marshal are final. We will be racing on a 3-lane, 32-foot track. Each heat will be announced. To eliminate possible variances in the track, each car will take turns racing in different lanes. Each racer will report to the end of the track to watch the race. A race official or assistant will make sure that the appropriate cars are loaded into their position and will start the race. The infrared finish line determines who crosses the finish line first. A race official or assistant will take the cars off the track and take them back to the “pit” for future races. Lane assignments for each heat are determined by a computerized lane spreadsheet. We use N-phase rotation so that each car can race against the maximum number of cars. Rank winners are determined by a computerized scoring of race times in each lane compared to all the other racers. The lowest, or fastest time will be considered the winner. In the event of a tie that the computer calculations cannot solve, a tiebreaker race will be held between the tied cars. During check-in, each car must pass a technical inspection before it may compete. If a car does not pass inspection (too long, too heavy or the like), the owner will have an opportunity to bring the car into compliance. If the car cannot be brought into compliance before race time the car will be permitted to race but will not be eligible to participate for prizes. No car may be altered in any way after it has been registered (this includes lubrication). Damage repair shall be allowed during the Derby at the discretion of the Race Marshal, but no modifications shall be allowed. After passing inspection, no car shall be re-inspected unless repaired after damage in handling or in a race. Except for damage repair, Scouts and parents will not touch their car after check-in and inspection until the Derby is over. For each Rank 3 Place winners will receive a medal, as well as 1 Best Design Award. The Best Design will be determined by votes from Cub Scouts of a different Rank. The minimum clearance between the bottom of the car and the track surface shall be 0.375 inches (0.9 cm) so the car will clear the center guide strip on the track. Weight shall not exceed 5 ounces (141.9 g). The reading of the official scale will be considered final. The car may be hollowed out and built up to the maximum weight by the addition of wood or metal only, provided the material is securely built into the body or firmly affixed to it. No liquids or loose materials of any kind are permitted in or on the car. Details such as steering wheel, driver, spoiler, decals, painting and interior details are permissible as long as these details do not exceed the maximum length, width or weight specifications. If a car jumps the track, the race will be run again. If the same car jumps the track a second time, and does not interfere with its neighboring car, the race will count. If the car interferers with its neighboring car, at the discretion of the Race Marshal, the car will be eliminated from that heat (and given a “did not finish” [DNF] time) and the race will be run again. If a car becomes damaged and can be repaired in a reasonable amount of time (a few minutes), the race will be run again. If not, the damaged car will be eliminated from that heat and given a DNF time. Except for damage repair, Scouts will not touch their car after check-in and inspection until the Derby is over.